I'm so excited to be able to share a new quilt for this spring's Bloggers Quilt Festival! My sister-in-law is expecting a little girl next month. I may have 4 children of my own, but I am VERY excited to finally be an aunt. So a special quilt was a must. It's a simple design created from half-square triangles. I used a variety of prints in navy, teal, soft red, coral, and yellow, based off the fabulous navy Tsuru floral. The light value fabrics are a spinoff of my much-loved mixed neutrals-- this time I used soft pink shot cottons, some Nani Iro double gauze, and off white Kona solids. 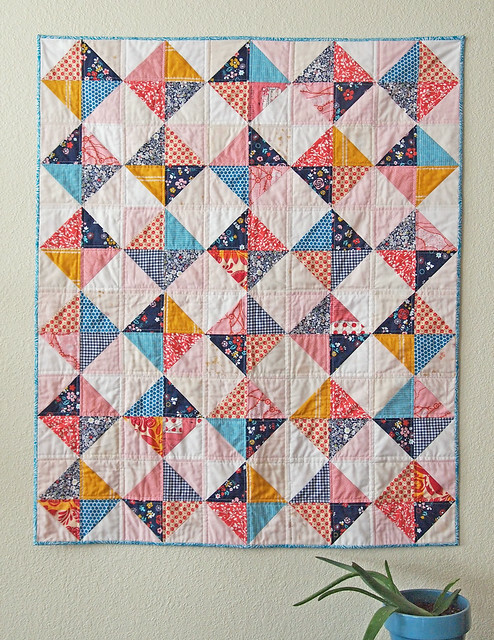 I think the mix lends a sweetness to the quilt without being overbearingly pink. I backed the quilt with a Kaffe Fasset shot cotton in Apricot. It is so incredibly soft! The binding is a fun teal floral I found at Jo Ann fabrics. I had originally planned to use a navy binding, but I'm not one to follow plans. I always feel so funny naming quilts that I give away-- but for the sake of the festival, I've named this one "Welcome to Nunaka." It has particular meaning for the family. But Nunaka also means "a good place to live," and my niece is certainly going to be greeted with a whole lot of love. Thanks for visiting! And have a great weekend. Your baby quilt turned out so well! I love the soft pinks for the background - someday I will be clever and think things like that up too. You have a very lucky niece to be welcomed with that quilt. Being an aunt is the best!! Beautiful quilt - the fabrics are fantastic! I love the mix of soft pinks! They work so well with the bolder colors. A very special gift for a baby girl! Holy cow, I love this. The light pinks are unexpected (I think). And they are just perfect. Gorgeous!! Love the fabrics you chose! Oh I love it. I like the colours ('though personally I'd change those soft pink parts but it'll give the quilt a whole different look). I like the pattern (have to try that). I love the look. Well done! I've been hoping to get a look at the whole of this quilt, Krista. I love it so much. The colours are lovely together (I also adore that Tsuru floral print) and the sweet mixed neutrals just make it so special. Such a sweet baby quilt! Adorable! I am sure your niece will love snuggling with this :) My entry is also a quilt for my new niece, hilarious! It is pretty special being an aunty, so fun to spoil them!! Krista! I'm absolutely smitten with this quilt! You've done a beautiful job showing what an impact colour choice makes. 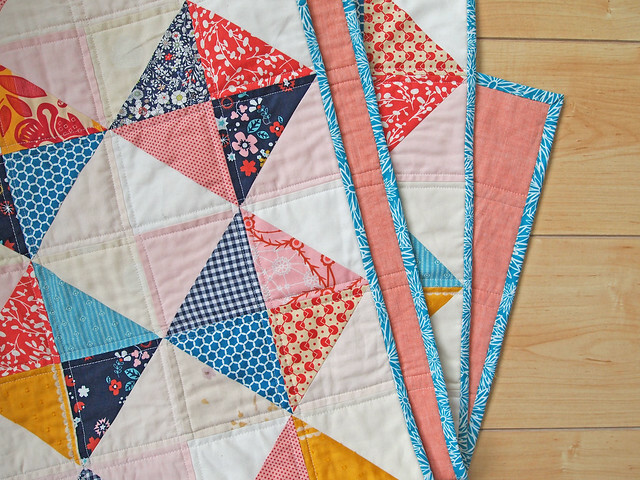 I love how the colours play together with the pattern and simple quilting. So so lovely. oh I'm loving this one! What size are your hst's? I love everything you make, so it is no surprise that this one is just as lovely. I probably would never have used soft pinks and reds together- it works beautifully here! You are so smart. I hope we get to see a photo of your new niece with her quilt!! seriously drool worthy!!!! I love it krista, and those close up shots, make it even better! Love the backing!! I feel really lucky that my local quilt shop carries almost all the shot cotton colors! :) You've outdone yourself! This is just beyond awesome. I do believe you are a print/color mixing genius. I would have never put some of those together but it looks so good! Your niece is a lucky girl! Wow, this is such a beautiful little quilt. I love everything about it, especially the varied muted tones for the background! 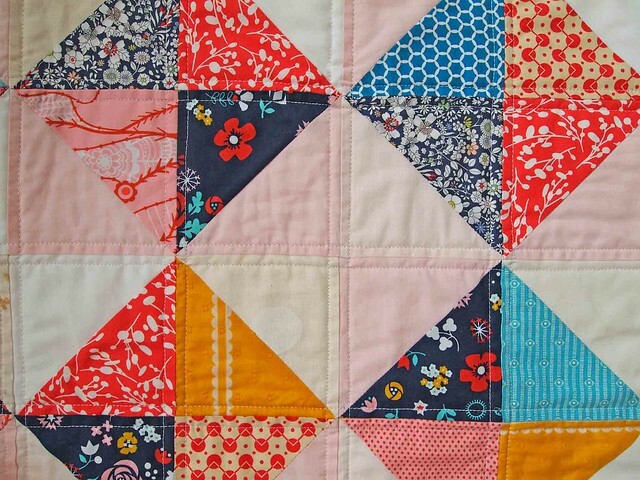 I am so in love with this beautiful baby quilt of yours that I cannot express it!!! Your fabric selections are perfection. My version was posted this morning: http://aquilterstable.blogspot.com/2013/06/summersville-baby.html. Thanks for the inspiration! My, that’s very sweet and thoughtful of you. I believe you will certainly be the coolest aunt your niece can have. I bet she will really feel cozy and sleepy all the time with your stunning presents. I wish I could have the talent and skill that you have so that I could likewise make special presents for my kids. I love this quilt Krista! you are so awesome.